Free to air is Television and Radio Services broadcast in clear (unencrypted) form, allowing any person with the appropriate receiving equipment to receive the signal and view or listen to the content without requiring a subscription. They are transmitted by air and satellite and can be received by an antenna or satellite dish. How much does Free to Air cost? What Free to Air packages do you provide? Do I need a licence for Free to Air? Does Free to Air have Saorview? What channels do I get with Free to Air? How can I get Free to Air? How does Free to Air differ from Freesat? 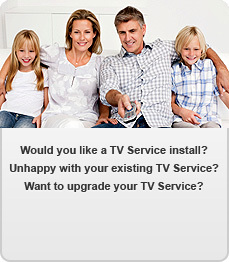 Why TV Services? How much does Free to Air cost? You only pay for the equipment and set up as Free-to-air channels are FREE! Ring us on 0872362881 or click here to book an appointment and a TV Services representative will guide you through the various options. Do I need a licence for Free to Air? You will already have an RTE license for receiving TV in your premises and no further action is required. Again Free to air is FREE. What channels do I get with Free to Air? For a list of sample channels available on Free to Air, click here to download PDF. How does Free to Air differ from Freesat? Free to air receivers allow you to receive all available channels were as Freesat has a specific channel list. Free to air receivers are generally cheaper than Freesat receivers. They can come with card readers for the purchase of subscription based channels. What Free to Air packages do you provide? You will need one receiver for each TV in your home. Customers require different needs and TV Services can help create the package that best suits your needs. Does Free to Air have Saorview? Free to air and Saorview are two different sources of signal but they can be combined within the one receiver. These receivers are known as combination boxes. How can I get Free to Air? To receive Free to air you need a satellite dish and a free to air receiver. TV Services supply and install a range of equipment for you to enjoy the benefits of Free to air TV. All TV Services Free to Air Satellite and Digital TV Installers Have A Minimum of 5 Years Experience. Your Local Free to Air Satellite and Digital TV Installers, With In-depth Knowledge of Your Area. Quality Materials & Tools To Ensure The BEST Free to Air Satellite and Digital TV installations and service.